After the devastating earthquake that struck Haiti in 2010, Swiss Re helped set up the Microinsurance Catastrophe Risk Organisation, or MiCRO for short (www.microrisk.org). Combining the capital efficiency of the reinsurance market with donor capital, MiCRO specialises in developing attractive and affordable insurance solutions for low-income populations, especially micro-entrepreneurs and smallholder farmers. 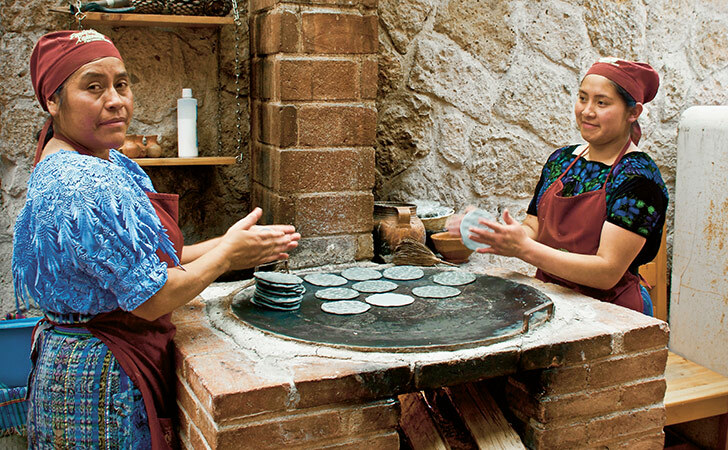 A mother and daughter team preparing fresh black tortillas for a small restaurant in the northwest of Guatemala. Working together with MiCRO and other partners, we help to insure small businesses and smallholder farmers in the country against natural disaster and weather risks that may threaten their livelihoods. In 2016, MiCRO launched a new product in Guatemala offering insurance protection against losses resulting from excessive rainfall, severe drought or earthquakes. It is an index-based solution, paying out automatically according to predetermined parameters and event data from objective sources, including NASA satellites. Local partners Banrural (www.banrual.com.gt) and Aseguradora Rural (www.aseguradorarural.com.gt) sell the policies. Swiss Re provided technical assistance during product development and reinsures the risks. The agriculture and small business sectors are vital to the further development of Central American economies in general, but are highly vulnerable to weather-related risks. On top of this, climate change is expected to aggravate extreme weather events, increasing both their frequency and intensity. MiCRO plans to expand such index-based insurance products to further countries, and has already submitted one for approval in El Salvador. The goal is to reach 250 000 people in the region by 2019.